Humidification is critical for most production businesses. Often overlooked, maintaining the proper relative humidity level can reduce or eliminate a host of manufacturing problems. This can lead to increased production, increased product quality, and increased profits. The Hydrofogger is the ideal solution for mid-size humidification. With a coverage up to approximately 45003 ft per unit (depending on humidity level desired), the Hydrofogger produces the humidification you need simply, quietly, and efficiently. 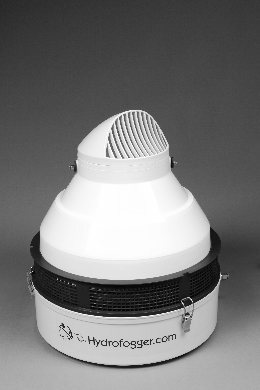 For applications requiring less humidification, we offer the Minifogger, which covers up to approximately 10803 feet. The Hydrofogger and Minifogger are best suited for such applications as greenhouses, hydroponics, orchid growing, concrete curing, and anywhere immediate humidity is needed. The Cuoghi NEB 6500 is a fully automatic humidifier that drains and cleans itself at the end of each cycle. It has more output than the Hydrofogger but operates on the same centrifugal principles. It can cover up to approximately 70203 ft (depending on humidity level desired). It can be fitted with a heating element for cold storage applications. The Cuoghi Mini NEB also drains at the end of each cycle, but covers smaller areas of approximately 19803 ft. These humidifiers are best suited for applications such as fruit/vegetable storage, laboratories, tobacco, and anywhere where critical humidity control is needed. Since they drain automatically and do not have reservoir pans, they do not require as much maintenance as either the Hydrofogger or Minifogger. Unlike other mid-size humidifiers, our humidifiers have fewer moving parts and do not require steam or treated water. They all come with smooth and powerful industrial-grade motors that will produce clean and ample humidification for years to come. Our units are designed to install in minutes, and they are fed automatically by a simple connection to a cold water supply. No need to ever fill the tank! Control your area's humidity level and your fogger by connecting it to our optional humidistats. Please note that our foggers are not intended for home use. Units are also available in 230V/50Hz for non-U.S. customers. We ship internationally. "I solved my humidification problems for my Indigo Press by purchasing a Hydrofogger from Hydrofogger.com. This little unit controls the press room very well, and it is priced right!" Questions? We are here to help you. Please call us at 800-936-3502 for Easy, Affordable, Turn-Key Humidification!